Miller’s Retreat is a spacious contemporary 3-bedroom cottage nestling on the banks of Crakehall Beck in Little Crakehall, a picture-postcard Yorkshire Dales village. With a private terrace looking out towards the Beck and the fantastic landscapes of Wensleydale and Nidderdale just a few miles away, it’s an idyllic spot for a relaxing country break. 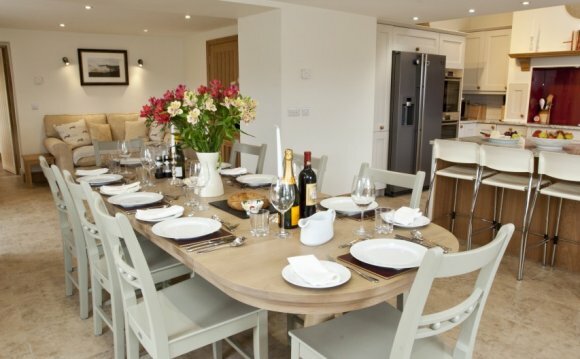 Set beside one of the few working flour mills in the country (run by the cottage owners), Miller’s Retreat is a newly refurbished luxury holiday cottage. The layout of the interior is designed to maximise the lovely view of the water, so the sitting room is on the lower ground level opening out onto a large terrace with bridge over the stream. This sunny open space is also the dining area with the kitchen down here too. Throw open the patio doors and have your breakfast with the sound of birdsong and the gentle lapping of the water as a backdrop. Back upstairs to the three very generous bedrooms. All of the bedrooms in Miller’s Retreat have either king-size or super king-size beds which can be made up as doubles or singles, ideal for families or groups of friends with various sleeping arrangements. All of the bedrooms are also en suite, two with a shower and the third featuring a bath with shower over. Each bedroom feels luxuriously roomy and with classic colours used throughout they feel peaceful and calm – the perfect combination for an excellent night’s sleep. Outside Miller’s Retreat there are several seating areas, the first is the large terrace by the patio doors, there is also a sheltered spot alongside this where the garden furniture sits. Head up the external stone steps and you’ll find a third little patio, just outside one of the bedrooms. Wander over the private bridge to the rear of the cottage and wander along the banks of the Beck. It opens up into a lovely open green space with meadows and trees all around… Take a picnic and enjoy the slow pace of river life. Head up in the opposite direction and a public footpath across the fields takes you through open countryside. Or simply stroll up to the gorgeous village green, have a drink at the village pub and settle down to watch the cricket team battle it out by the large manor house.